It was oh so warm here this weekend. I don't know about you, but warm weather always inspires me to get out my candy colorful bangles. I have a secret drawer where I keep my bakelite collection. Only, this stash is different. This isn't bakelite, but it's super fun plastic bangle mania. I have kept them in this big bag, since I left the city house for good last year, and have not 100% found places for everything at the country pad. Which ones to wear, which ones to choose? It's funny, because every time I pile them on folks come up to me and ask, where did you get them? It's just fun stuff, and I think it inspires others (who love color and playful attire) to want to have a wild and wacky plastic bangled arm too. I went through my stash and came up with this big stack of bracelets below, to give away. The pile below, plus the ones I am wearing in the photo below, are all for one of you. Lots of goodies from my own personal stash. If you'd like, you can share something memorable from one of your warm day memories. I think the summer going into 7th grade was the funnest summer ever. Scrunchies towering in a ponytail. Bunch up socks and Keds tennis shoes. Riding bikes all over town. Painting on tennis shoes, and gluing pearls and stones all over them. Tears for fears & A-ha tapes playing in the pastel pink radio. Feeling like all the dreams and world of pure magic lied ahead in spades. That is the sumer I really remember well. Falling in love with 6 boys. Okay, so, I best stop chattering. And let you enter to get a huge goody bag of bright bangles! Oh my! sale time came at me so fast. I was up sooo late, after 1 a.m.
We all ate so much we could not move. We laughed so much we cried. 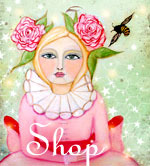 She is also giving away a $50 gift certificate to her shop. Right here, right now, just leave a comment to enter. A giveaway, plus a sale, which you can apply to your gift certificate if you win. Miles Birthday. Loved his big horse. I cooked so much, and my friend brought some fresh/raw homemade cran-orange relish, homemade lemon meringue pie (with her own lemons) and salad. Turkey that fell off the bone, brown sugar candied yams, mashed potatoes, stuffing chock full of delicious veggies, green bean casserole, oven baked croissants, fresh cranberry orange rind relish, herb vinaigrette salad, 5 pies (lemon meringue, traditional pumpkin, pumpkin cheesecake), dessert wine, and so much more I can't recall now. Are you so tired today? Refreshing pomegranate seeds after a long night of fun. So you say you believe in fairies do ya? Would you say there are fairies spreading fairy dust in all sorts of venues? Like, let's seeeeee, ummm... Hotels maybe? Well, you can imagine my surprise, when a certain LA based art director contacted me from the creative hub of such books. Nah, I thought. It ain't for real, it just is not. Must be a scam. They must want to bill me for all the books I have collected from hotel to hotel... Yep, that must be it. Now that I look back on it, he must have thought I was a certified nutcake. I sounded like that kid in home alone, asking oodles of questions, and the guy he is asking questions to, is like, "get lost kid..."
OH me oh my, says I ;) There really must be fairies! Anyhow, fast forward to Tuesday. Off I go a merrily skipping along in 3 night gowns and 4 crooked crowns, in the dirt, and check my mailbox. Only to find a parcel so lovely, I squeal. Mister Lovee is driving down the driveway towards me as he is leaving for the office, and I throw myself on his car, I roll over it, and wonder if I should roll in the dirt too? WHAT? I never, not ever, not in a million years, expected THIS! Wholey Guacamole, it's my BABIES!! What, who, where?? Oh goodness me, I must roll in the dirt out of glee! There are a couple of snippets of my verbage throughout, and even an plug for wonderful magnificent Etsy!! In my late teens and early twenties, lots of people I met in the world, tried to break me down. Tried to hurt my soul, tried to tell me what I did or what I made, wasn't good, just to be mean. Sometimes I fell, and cried, and got incredibly hurt, but I always got up, and kept holding on to art and creatures and ideas. I learned how to nix the negative out of my life. I built my life around art, made all my life's decisions with art in mind. Art saves me, little faces save me. So, when I see my creatures in a little book as such I smile, and it fills my soul with such bursting joy. In my humble way, I say, we should try to never let go of our dreams. ps: So, if you read a few paragraphs above, I eluded to Misters Lovee's fire incident (it happened last year). Can I just tell you what he did? Please don't tell him I am outing him here like this. So, there he is making a simple dish called, Oatmeal a la fireball. I am sitting at the computer, where I can see into the kitchen. All of a sudden, I notice the entire back of his robe is bright orange with a blue glow over the top, and flames around his neck. And I scream, LOVEE YOU ARE ON FIRE!! YOU ARE ON FIRE!!! He looks at me, puzzled, wide eyed. Then realizes what I am saying, and rips off his robe. Luckily, it was when he had that long ponytail last year, and so, he just lost a bit off the bottom... He had some threads hanging off the terry cloth robe, that I guess caught on fire, and traveled up the back of his robe, from top to bottom. I guess Ralph Lauren doesn't believe in fire resistant night garb? pss: Did you watch Marley and Me? Oh goodness, I cried so hard last night, my heart felt like it was cracking. Off I go to hug my pooch til she begs me to leave her alone.